If a hollow, deep-set eye structure makes you feel like your eyes are always shrouded in shadow, especially in photographs, you're in mighty good company -- and with some famous beauties, too. Celebrities like Taylor Swift, Keira Knightley, Megan Fox and Cameron Diaz share your eye structure and your concerns. They have to be prepared for pictures all the time -- but unlike you, they also have on-call professional makeup artists to help bring out the best in their features. Your eye shape shouldn't prevent you from diving into the latest cosmetics trends -- but you should follow a few general application guidelines to keep your eye area looking its best. 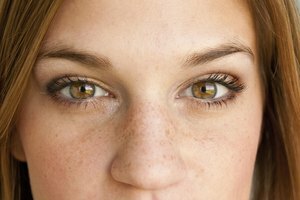 Whether or not you also have dark undereye circles from hereditary thin skin or allergies, your orbital sockets cast shadows that make your eyes appear to recede. Brighten and open up the eyes with a creamy moisturizing color-corrector and concealer. Choose a color-correcting concealer based on the color of your eye area. If the skin is purplish, choose a yellow or orange-based concealer. If the skin is greenish, choose a pink-based concealer. Dip a concealer brush into a color-correcting concealer. Draw a vertical line from the inner corner of your eye down to the top of your nasolabial fold, or smile line. Draw a horizontal line from the inner corner of your eye to the outer corner of your eye. Connect the open ends of each line with a diagonal line to create an inverted triangle. Dip your brush into a highlighting color-corrector and fill the triangle. Lightly blend the edges with a sponge applicator so that it does not look harsh. Swipe concealer over the color-corrected triangle with a concealer brush. Blend well with a sponge applicator. Select a concealer color that matches the skin just under your eyebrow. Make sure the formula is more matte than shiny. Dip a sponge applicator into translucent powder, then press and roll it under your eyes to set the concealer color. If necessary, apply more concealer over the powder and set it with powder again, as many times as it takes to cover orbital shadows. On the final layer, apply a concealer that is one shade lighter than your skin tone and set with a shimmer powder. Now that your undereye area matches the rest of your face, enhance with highlighting colors that will make your eyes pop -- figuratively -- in photos. Brush over your entire eyelid with a highlighting color, which should be an eye shadow color that is just a few shades lighter than your skin tone, to brighten your eyes. On the center of the eyelid, sweep a medium-toned neutral that is similar to your skin tone. Dab a pale peach-pink color on the outside corner of the eye, and a shimmery silver on the inside corner. If you want to add darker colors, keep them to the outside edges only, where they will elongate the eyes. For example, pat dark color along the outer third of the upper and lower lash lines and slightly beyond to make a smudged wingtip. Draw a medium to thick line of kohl eyeliner at the upper lashline and smudge it with a smudge brush. Avoid harsh lines. Draw a thin, soft line of eyeliner at the lower lashline, or leave the lower lashline bare. Never go thick with liner on the lower lid. Finish with lengthening mascara on the upper lashes only.